Norcros Adhesives, manufacturer of tiling adhesives, grouts and surface preparation products, speeds up tiling on to green screeds with its latest system solution. Pro Gyp-Base Fast Track Sealer greatly reduces the minimum drying times normally applicable for anhydrite (calcium sulfate) screeds. The new product comprises a three-stage preparation system for fixing ceramic and porcelain tiles on to screeded surfaces. It is sold as a kit containing all the elements necessary to achieve a successful bond, including a primer, moisture suppressant and gritted primer. Used together, the system allows for fast track tile installation without detracting from the overall screed strength. It also avoids the need for a special tile to gypsum adhesive, which is normally required for tiling on to anhydrite screeds to prevent the tiles from debonding. Pro Gyp-Base Fast Track Sealer can be used on either heated or unheated anhydrite screeds. A 15kg kit contains everything required to prepare and seal approximately a 25sq m area. In an ambient temperature of 20°C, drying times are down to two hours for the first primer coat and 24 hours for the second primer coat. The moisture suppressant and gritted primer require a total of three hours drying time before tiling commences. Screeds need to be a minimum of seven days old and have a maximum relative humidity of 95 per cent. 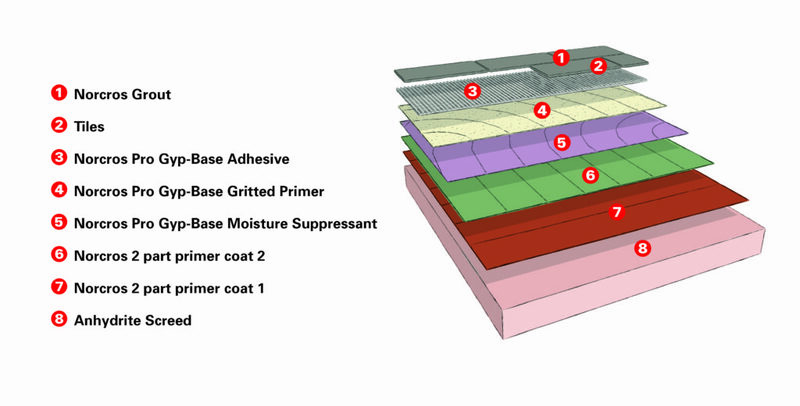 After drying, tiles may be fixed with the new Norcros Pro Gyp-Base Adhesive. This is a white cement-based, flexible, fibre-reinforced, thin bed cementitious adhesive specially formulated for fixing fully vitrified porcelain, ceramic and stone tiles to Norcros Pro Gyp-Base Fast Track Anhydrite Screed Sealer. It has a setting time of three hours at 20oC permitting early trafficking of the tiled installation. The adhesive has excellent thermal ageing properties making it suitable for use on heated floors. It is sold in a 20kg pack. Need to work out how much adhesive or grout your project will need?